From my point of view, the diversity in the two groups and the presence of almost all ages had a great impact on our cohesion. Mr. Gropper repeatedly told us how surprised he was by our team spirit and our progress, considering the choirs essentially consisted of total strangers. 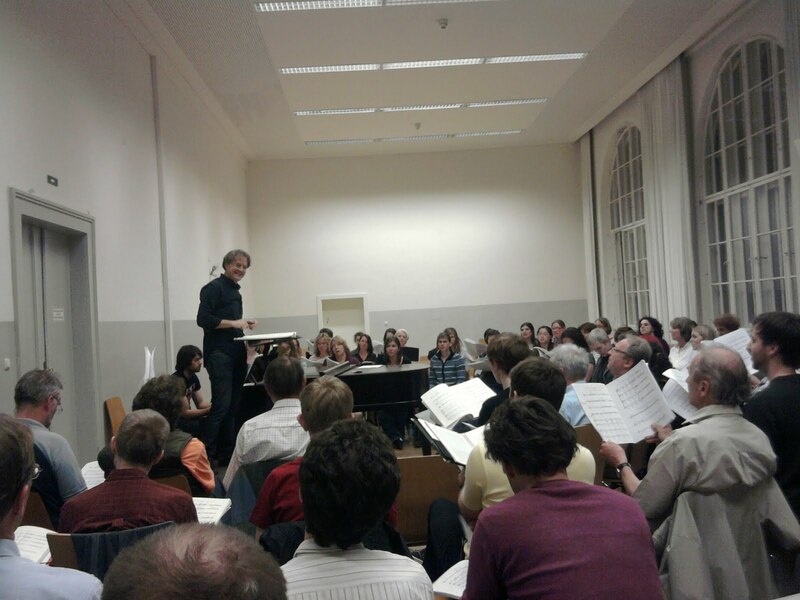 Shortly before our last rehearsal with Mr. Gropper, the organizer gave us some information about the concerts. We are to dress entirely in black and use a black cover for the sheets. Did I mention that the theatrical version of the movies will be shown ? When I think about it, a 4 hour long concert wouldn’t do anyone good… The tuning forks used by few of us have to be bound to a string, because believe it or not, we constantly heard falling forks during past rehearsals, creating a crashing noise. Of course, there will have to be complete silence during the breaks and no applauding. Now that’s what I call professionalism! These news got me both really excited and sad, because it meant we were approaching the end of the project. There comes a time in every activity where you reach a certain maturity and I’m quite sure I reached my musical turning point during this venture. It is not only due to Mr. Wicki’s methods and perception of the music, but also to the music itself. 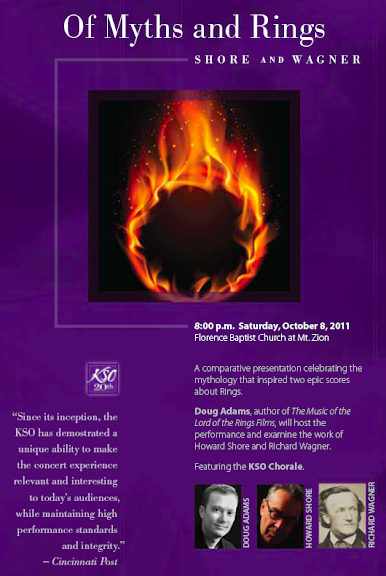 Everyone knows epic, powerful music abounds in ROTK. 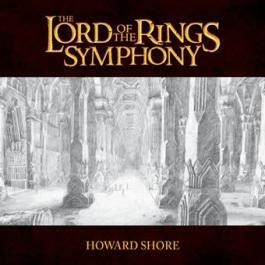 For instance, "The Siege of Gondor" at 4:12 embodies the ultimate clash of good versus evil and as such gives me a sensational feeling of almightiness as soon as Ludwig Wicki shows the beat and all 100 choristers start singing. I’m sincerely sorry, but there is just no word for describing the magic of this moment. It is (more or less) shortly followed by "Mount Doom" which describes Frodo’s struggle with the Ring. At 1:26, the apotheosis. You finally understand the true power of the Ring as well as the power of music, invading your mind and taking you right into Mount Doom. Let it be said that at this point of the movie, you feel an unbearable desire to continue singing no matter what the sheet says. On April 15, we rehearsed with the orchestra for the first time. 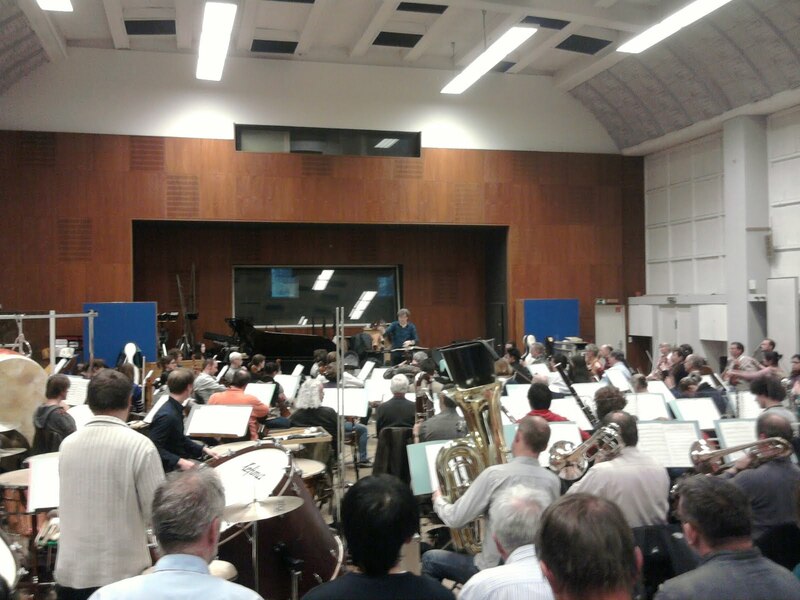 It took place in a music studio near the Philharmonie, which added to the excitement. You may notice the choir doesn’t sing much when you listen to the whole soundtrack of each movie and I was first struck by it during this rehearsal. It’s certainly due to the fact that I rarely listen to the full soundtrack and rather pick out my favorite parts (which often include the choir). I was so amazed by the orchestra! They played the music exactly the way it was recorded and there wasn’t any of those alterations I was used to in high school. I know it may seem natural to some but I had never performed with a professional orchestra before. I was also happy to recognize some unconventional instruments like metal plates used for the Isengard theme that I had seen in footage in the EE. With less than a week left to the concerts, the general euphoria became largely perceptible. Prior to my participation in this project I had bought a ticket for the FOTR presentation on Sunday, April 17. Time to see what Live to Projection was worth!